If your dogs is friendly towards other dogs and like to greet them enthusiastically this post is for you – some dogs need space from your dog. If your dog is sometimes reactive towards other dogs this post is also for you! Your dog needs space from other dogs. It is a hard post to write, and the content is extremely emotive, but this needs to be said… again and again until dog owners begin to listen. Some dogs need space. First let me share two stories with you. When I say “stories”, I mean real life events that I am going to present to you. One is an experience I read on Facebook, the other happened to me only last week. The first involves a greyhound who was out walking with his mum. Like many greyhounds (often they are rescues from a racing background, with minimal ‘normal’ life experiences), he displayed an anxiety/fear response to other dogs. We often call this response reactivity, because it displays as a hostile reaction to other dogs when they come too close. Because of his unpredictable, anxiety-driven behaviours he was being walked on a lead, totally in control and minding his own business, when over the field came a large, bouncy, overly friendly dog who rushed right into his space. This caused him to panic and try to move away, and the incoming dog – oblivious to his obvious signs of distress – persisted in his demands: “Play with me! Play with me!” In blind panic and to escape this jumping, dancing and pawing bundle of dog “friendliness”, the greyhound slipped his collar, ran off the field, out in front of a car and was killed instantly. Story number two is mine. I was walking a dog (a rescue with a difficult past), who I knew to be reactive in terms of barking and lunging at dogs that he felt were too close. Neither I, nor his owner, truly anticipated what would happen if a dog ever reached him and refused to be warned off… We were walking on the far perimeters of a park about 150 yards from the main path. He was on lead, clothed in bright yellow vest that said in large black letters, “I need space”. I had the extra insurance of a muzzle, in case I saw a loose dog behaving erratically. Around the corner (150 yards away) came a little terrier, who spotted us as I spotted him, and while I was muzzling up, he was flying across the space between us. His owner was too far behind, or too certain of his “friendliness” to even bother to try to recall him. Sadly, he ran full pelt into ‘my’ dog’s face, before the muzzle buckle was secure, and my charge flipped. A second or two of initial growling didn’t deter the terrier, who was paws-up scrabbling at his face: “Play with me! Play with me!” I didn’t have time to physically get between them, and couldn’t get hold of the unknown dog to keep them apart. Then the dog I was walking took the only option open to him to “make it stop” and picked the terrier up in his jaws. He wasn’t fighting. He was immobilising. It was the human equivalent of holding someone – literally – at arms length. Having stopped the frenzied dancing and scrabbling, he was understandably reluctant to let go, but after the kind of ‘few seconds’ that somehow spread out into an ocean of time, he did – and the little one ran off. Screeching, bleeding and in shock. Imagine the impact on the walker? The owner? The little dog? Their owner… the already terrified-of-other-dogs “aggressor”. 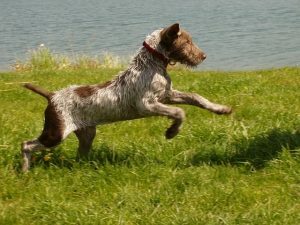 Running into another dog’s space – making demands – isn’t being friendly (whatever the motivation), it’s at best rather rude, at worst intimidating and can lead to panic or fear-driven aggression in a sensitive dog. So for those of us who are lucky enough to be walking oober friendly, dog-sociable dogs, we must be respectful of the need for some on-lead dogs to maintain their own personal space. If a dog’s on a lead, it’s usually on a lead for a reason. Work on your own dog’s recall and perhaps put them back on-lead for a short time, if you can’t accurately assess the situation. As soon as you get close enough, you can talk to the other owner, but you can usually tell by body language that space is needed. They may shorten the lead, move away from the path, turn and go in the opposite direction, or go to put on a muzzle or other restraint. 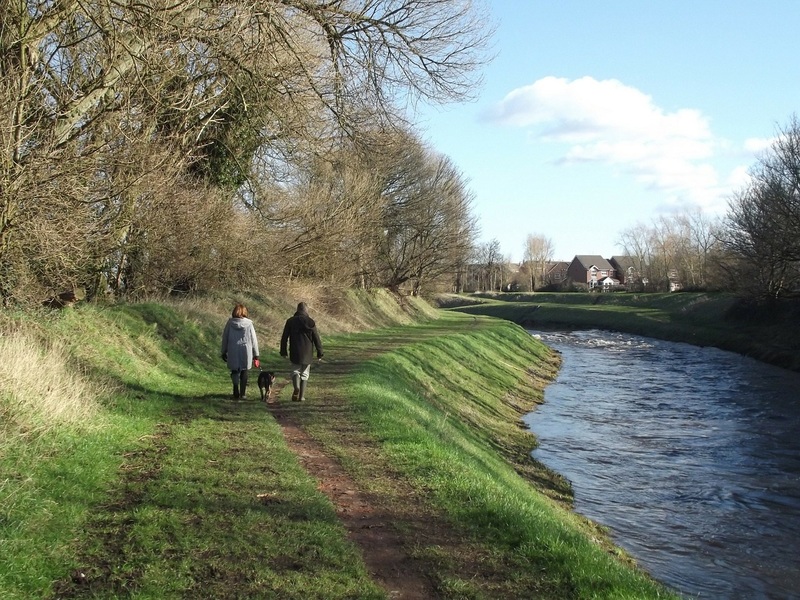 It’s good practice – and good manners – as a matter of course, not to let your dog approach an on-lead dog unless it’s clear from the owner that it’s okay. A dog can be on-lead because of poor recall, straying tendencies or fear of other things; not all on-lead dogs are reactive. If you can’t get your dog back when you need to, then he’s not under control and you are in breach of UK law and potentially liable for any problems he causes. Try using a long training lead for a while, and work on a strong recall in just these situations, using high-value treats and loads of praise. And those of you who have highly anxious and dog-reactive dogs, perhaps the biggest lesson learned here is muzzle-up whenever you are in a space where other dogs may be off the lead. I agree you shouldn’t have to, but you can’t rely on other dog owners taking responsibility for their dogs, so if you think your dog would need a muzzle if he was nose to nose with a strange dog, then I would personally use a muzzle at all times going forward. Dog-to-dog reactivity can often be addressed, improved and sometimes overcome with intensive training, habituation and care. Courses like this one, from one of the countries leading TTouch practitioners, are individually modified by input from the creator, Janet Finlay, for your particular situation. Postscript: The little terrier in my story needed treatment for shock and a number of puncture wounds, but made a full recovery – at least physically. Our business covered the costs, despite a number of professionals at the vet’s saying that it was the terrier’s owner who was liable, because her dog wasn’t under her control. I am hoping my business insurance will help with the £350 plus bill. Have you considered using a muzzle. Thus can be a really simple way of regaining the pleasure of walking, without feeling high anxiety all the time. Also I recently did a wonderful course which helps you with all kinds of aspects of building confidence in yourself and your dogs when walking. It’s called Your End Of The Lead. And well worth the investment if you really want to make a difference.